Avon’s youth-oriented Mark brand has launched Jewel Shine, a new fragrance for women. Jewel Shine is a flanker to 2007′s Jewel. With hints of sparkling bergamot, golden gardenia and warm marshmallow, mark. Jewel Shine dazzles and delights. 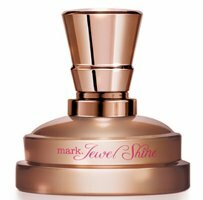 Mark Jewel Shine is available in 50 ml Eau de Parfum. If that bottom part is a separate stand for the bottle, and the bottom of the bottle is curved like the top, then I love it. If that’s all one single object, then I hate it. ‘Smores notwithstanding, warm marshmallow sounds faintly disgusting. 99.9% sure it is all one bottle…if you click on the link above for the original Jewel scent, obviously they’re the same design & that one sure looks like 1 bottle. You’re quite right. At least the copper-coloured bottle doesn’t look quite as cheap and tacky as the clear red one. Wow that is one incredibly tacky looking bottle.